Husayn-‘Ali [later known as Bahá’u’lláh] was born November 12, 1817, at dawn when the birds begin their songs. He was born in the land of Persia, in the city of Tehran. According to the Muslim calendar used in Persia, the day of His birth was the second day of the month of Muharram in the year 1233 A.H. At that time, Fath-‘Ali Shah ruled Persia, and King George III was King of England. James Monroe was President of the United States, which had only nineteen states, Abraham Lincoln was a boy of eight, living in Indiana, and Frederick Douglass was a baby, born into slavery in the state of Maryland. Early on, His parents recognized that Husayn-‘Ali was an unusual child. His mother often wondered how a baby could be so happy and content all the time. “This child never cries!” she would exclaim. But what truly astonished them as they watched their young son grow was His extraordinary knowledge and wisdom. His simple education was no different from that given to other sons of the Persian nobility. Tutors came to His home to teach reading, writing, and Persian culture, just as they did for the other boys. Husayn-‘Ali learned to read the great Persian poets – ‘Attar, Hafez, Rumi – as the other boys did, and to recite from the Koran, the holy book of Islam. He did not study science, for science was viewed with suspicion in nineteenth-century Persia, nor did He study philosophy or religion. Those were left to the mullas and mujtahids—Muslim scholars who spent long years studying the teachings, laws, and traditions of Islam. Yet Husayn-‘Ali showed a lively interest in spiritual topics, and from His boyhood He displayed a profound understanding of spiritual truth. His understanding was innate and reached far beyond the knowledge of His teachers. Although Husayn-‘Ali was never arrogant or boastful about the knowledge that came so easily to Him, neither was it something He could hide. As Hnsayn-‘Ali grew into a youth, His father could find Him, from time to time, deep in conversation with the most learned of men. They welcomed Him into their company despite His young age. His understanding of the Prophets and Their teachings, of the nature of God and the human spirit, added much to their discussions. By the time He was fourteen years old, Husayn-‘Ali’s innate knowledge and wisdom were recognized by all who knew Him. He wondered how his young son could know these things. Did His gift have something to do with the noble ancestors of their family lineage? Through His father, Husayn-‘Ali was a descendant of the great Persian kings of old as far back as Yazdigird the Sassanian. He was also a descendant of two holy Prophets: the Persian Prophet Zoroaster, Who taught His followers about the battle between good and evil; and Abraham, Who taught the Jews to worship one God. Mirza Buzurg pondered these things about his young son. One night he dreamed a strange dream. In his dream he saw an ocean stretching in every direction as far as the eye could see. In the center of the ocean swam Husayn-‘Ali, strong and peaceful, with His long, jet-black hair floating on top of the waves. His body seemed to glow with light, attracting fish from every direction. As the fish gathered around Him, each clung tightly to one of His hairs; but the fish did not bother Husayn-‘Ali. He swam freely wherever He wished, while the fascinated fish swam with Him. When he awoke, Mirza Buzurg remembered the dream clearly. It seemed strange yet wonderful, as some dreams do. But what did it mean? He would need to call on a soothsayer who was wise in the language of dreams to find out…. When the soothsayer came, he listened closely to every detail of Mirza Buzurg’s dream. Finding the truth of a dream could seem like winding through the maze of a marketplace, but the soothsayer was experienced in interpreting the language of dreams. Soon it was Mirza Buzurg’s turn to listen as the soothsayer spoke. The ocean was the world, he explained. The fish that gathered around Husayn-‘Ali were the peoples of the world. Husayn-‘Ali would cause great confusion and turmoil amongst them, but no one could stop Him or stand in His way. Not even the soothsayer could tell the exact path of events that would unfold Husayn-‘Ali’s future. But Mirza Buzurg’s heart was deeply moved. The soothsayer’s words confirmed his own thoughts about the boy Who was wise beyond His years. The finest qualities of those kings and Prophets who were their forbearers was reflected in the brilliance of His spirit. Now more than ever Mirza Buzurg was determined to protect and care for his beloved son. Everything that was his—wealth, position, and honor—he valued only for this purpose. Mirza ‘Abbas Buzurg, who served as a vizier of the shah, was himself a man of both talent and good character. Unlike many officials who were easily influenced by anyone willing to pay a price, Mirza Buzurg was a just man who decided matters fairly. Although wealthy, with mansions in both the city and the country, Mirza Buzurg showed compassion toward the poor and always gave generously to those in need. He was a highly regarded calligrapher who created beautiful designs from the graceful lines of Persian script. The shah himself had honored Mirza ‘Abbas by giving him the title Buzurg, which means “Great One.” He was known throughout Persia and respected by his countrymen. Husayn-‘Ali, Who loved His father dearly, called him “Master” to express His own deep respect for one whose source of nobility reached far deeper than mere title. It was the custom in Persia that sons follow their fathers in skill or profession. Other people expected Husayn-‘Ali to hold an important government office when He came of age. No one doubted that Husayn-‘Ali, like His father, would continue to be welcomed at the royal court. Like the other boys of noble families, He had learned the etiquette that governed behavior at the royal court, but such a life and career did not attract Husayn-‘Ali. He saw that many of Tehran’s privileged, unlike His own father, were less concerned with justice or the needs of the poor than with their own enjoyment. How they vied with one another in their feasts and lavish lifestyles, in acquiring “heaped-up treasures” and “gorgeous finery”! How they schemed and maneuvered for the power and prestige they so coveted! But Husayn-‘Ali remembered the puppet show [that He saw during the festivities associated with His older brother’s wedding] and how the puppets, with all their pomp and glory, were put away in a box at the end of the play. For Himself, Husayn-‘Ali much preferred to mount His horse and ride out of the city gates into the countryside and the mountains beyond. Among the tall trees and rocky paths He heard no scheming or gossiping tongues, only the gentle rustling of leaves, the soft splashing of meandering streams, and the sweet warbled songs of birds. Here paused and darted the swift, black-eyed gazelles, whose graceful beauty had been captured by Persian poets for a thousand years. Here Husayn-‘Ali felt a deep contentment that He did not find at the court of the shah. When Husayn-‘Ali rode out of the city and through the Persian countryside, He would pass the simple stone and mud-plastered homes of humble farmers and villagers. Often He would stop to talk with the people who lived there and ask about their concerns. How were their families faring? Did they have enough to eat? Was anyone sick, in need of a doctor or medicine? Wherever there was a need, He would see to it that help was given. Sometimes a dispute needed mediating or an injustice needed attention. Here, too, Husayn-‘Ali gave assistance. Even as a youth, He was not afraid to speak up at the shah’s courts in defense of the weak and innocent. I am at thy command. This is the home of Love; enter with reverence. He is God! O concourse of the lovers of God! By the righteousness of the Almighty! This, verily, is a night the like of which hath never been manifested in the world of creation. Truly, this bounty is from God, the All-Powerful, the Beneficent. On this night, the Spirit spoke with a voice that threw into commotion the realities of men: “Rejoice, O Concourse on high in the inmost essence of Paradise!” Thereupon, God cried out from behind the Holy Veil of divine bestowals: “This, truly, is a night during which the Reality of the All-Merciful hath been born and the meaning of every eternal decree hath been divulged by the Pen of the All-Glorious.” Therefore, rejoice and exult, O people of the Bayán! Say: This night the veils of glory concealing the light of certitude were rent in twain and the Dove of Heaven chanted and sang in the midmost heart of Paradise. Therefore, rejoice O Temples of Holiness dwelling in the city of time! On this night, God revealed His light through every exalted Name. Moreover, He hath been established upon every pure and radiant heart. So rejoice, O ye people of the Bayán! During this night, the oceans of forgiveness have surged and the breezes of divine bestowals were wafted. Therefore, rejoice with exceeding gladness, O companions of the All-Merciful! On this night, all the sins of mankind have been forgiven. This is a joyous message unto all created things! Say: This, verily, is a night during which a pre-ordained measure of bounty and grace hath been decreed in the Scrolls of celestial glory and certitude, so that sorrow may be dispelled from all created things forever more. Therefore, rejoice in thy hearts, O ye who hath entered the realms of being and creation! At this, the Herald of the Spirit crieth out in the midmost heart of eternity — the center of transcendent glory and sublimity. This is by the grace of God, the Omnipotent, the Beneficent! By God! The Hand of Power, endowed with ascendant sovereignty, hath opened the musk-scented seal. Verily, this bounty is from God, the Exalted, the Beneficent! Through the Beauty of the All-Glorious, the hand of the Divine Joseph hath borne round the cup of pomegranate wine. Verily, this bounty is from God, the Exalted, the Beneficent! Therefore, O peoples of the world, hasten and partake of this Salsabil of everlasting life. Verily, this bounty is from God, the Exalted, the Beneficent! Say: O concourse of the lovers of God! The unveiled and naked Beauty of the Beloved hath shone forth. Verily, this bounty is from God, the Exalted, the Beneficent! O concourse of the loved ones of God! The Beauty of the Best-Beloved hath risen above the Horizon of Holiness. Therefore, bestir yourselves and arise, O people of the Bayán! Verily, this bounty is from God, the Exalted, the Beneficent! The Testimony and the Proof hath appeared, for the Resurrection hath come to pass through God’s Manifestation of His own Self, the Ancient of Days. Verily, this bounty is from God, the Exalted, the Beneficent! The ages have persisted, the cycles have repeated, and the Lights have rejoiced, for God hath shed the splendor of His effulgent glory from the branches of every Tree. Verily, this bounty is from God, the Exalted, the Beneficent! Bestir yourselves, O chosen ones of God, for the spirits have emerged, the divine winds have been diffused, the likenesses of God have been torn asunder, and the Tongues of Eternity have sung upon the boughs of every Tree. Verily, this bounty is from God, the Exalted, the Beneficent! By God! The veils have been rent asunder, the dense coverings have been consumed by fire, the abstruse allusions have been unveiled, and the subtle signs have been unraveled by Him Who is endowed with Power and Omnipotence. Verily, this bounty is from God, the Exalted, the Beneficent! Rejoice and silently conceal this secret and hidden Symbol, lest your foes learn of that which ye have quaffed from this wine of rapturous joy. Verily, this bounty is from God, the Exalted, the Beneficent! O people of the Bayan! I swear by God! The favour of God is fulfilled, His mercy perfected, and the light of the divine Countenance hath shone forth with exultation and rapture. Verily, this bounty is from God, the Exalted, the Beneficent! Drink ye, O concourse of people and assemblage of God’s loved ones, from this effulgent and radiant Salsabil! Verily, this bounty is from God, the Exalted, the Beneficent! 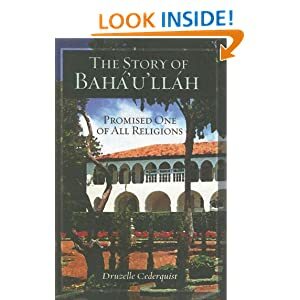 The Story of Baha’u’llah: Promised One of All Religions by Druzelle Cederquist is an inspiring and dramatically paced introduction to the Prophet and Founder of the Baha’i Faith. It presents in a clear narrative style the life of the Prophet from His birth into a wealthy and noble family, through His transforming spiritual experience while incarcerated in the infamous Black Pit of Tehran, and over the decades of harsh and increasingly remote exile that followed. Woven into the story are Baha’u’llah’s principal teachings and references to historical events and persons that place the development of the new religion in a global context. This book chronologically follows the story told about the life of the Bab, in Release the Sun. This book is written in straightforward language, with the author employing techniques of fiction to tell a true story, which makes it part of the compelling new genre called creative nonfiction. Readers have called it “easy reading but deep thinking”. This month I’d like to feature a beautifully done, meditative look at the life of Baha’u’llah. I don’t know who gets the credit for it, but on the YouTube page it says it’s: “A slide show of the life of Baha’u’llah. It was created to celebrate the Birth of Baha’ullah. Images taken from the calendar that was prepared by the Baha’is of Hawaii. Please have a look! Dimity Podger is Principle Director and Business Coach at Barasa Consulting Group. She helps organisations create, evaluate and deepen their Corporate Values Strategy through her Values@Work™ program. Her Values@Work™ Series is designed to equip leaders, managers and teams with capabilities and practical solutions to create purposeful, values-driven organisations that are creative, positive, productive and innovative. Have you ever been stuck trying to pull together a Feast, Holy Day or Devotional Gathering at the last moment? This site offers programs, with music; and so much more! Wendy Scott’s original songs express many of the most sublime thoughts and ideals found in the Bahá’í Writings and help us all feel a sense of reverence and appreciation for the guidance we have been given by God for our lives. The songs are musically diverse and represent a variety of cultural styles. Here you will find prayers; original compositions; and arrangements of familiar hymns and tunes. She has five CDs currently available, with vocals by Wendy Scott and Ron Lyles. Her piano accompaniments are easy enough for most pianists, and there are guitar chords displayed especially for guitarists. The melodies are fairly simple, with a message that seeks to enhance our relationship with God, and will enable people to sing individually and together in praise of God and appreciation of His teachings. She likes to find unusual writings we might not hear all the time, to make her programs even more interesting. In addition to the writings, her programs include three songs (from the Writings) and one to start the social portion off on a lighter tone, designed to inspire us to enjoy fellowship and unity and inspire us for service. Medium – includes specific Writings in a single-sheet format; 4 MP3’s; a printable booklet program for the Feast, with accompanying sheet music for the songs and a license to print out up to 9 copies of the sheet music. Heavy – includes specific Writings in a single-sheet format; 4 MP3’s; a printable booklet program for the Feast, with accompanying sheet music for the songs and a license to print out as many copies of the sheet music as you need. Wendy offers 77 devotional programs which can be used for both mini-deepenings as well as worship, to inspire us to higher levels of service and interest our seekers in learning more about the Faith. The programs are grouped around relevant themes on various virtues and spiritual topics; for use on or near Bahá’í Holy Days, several anniversaries that ordinarily get ignored, and special events. I love Wendy’s beautiful 9-pointed star car magnets (see picture above). Each star is made of magnetic vinyl and die-cut to just under 3 inches in diameter, and available in three colors (gold, holographic prism or chrome). Priced right for Ayyam-i-Ha ($4-$5), this Bahá’í symbol helps to make a presence for the Faith wherever we go. It’s a great help in finding a meeting location, especially when all the cars have them displayed! A Baha’i new to our town saw my car with the star in a parking lot; recognized it as a Baha’i symbol and stopped to talk to me! You’ll want to order yours now, while you’re thinking of it!